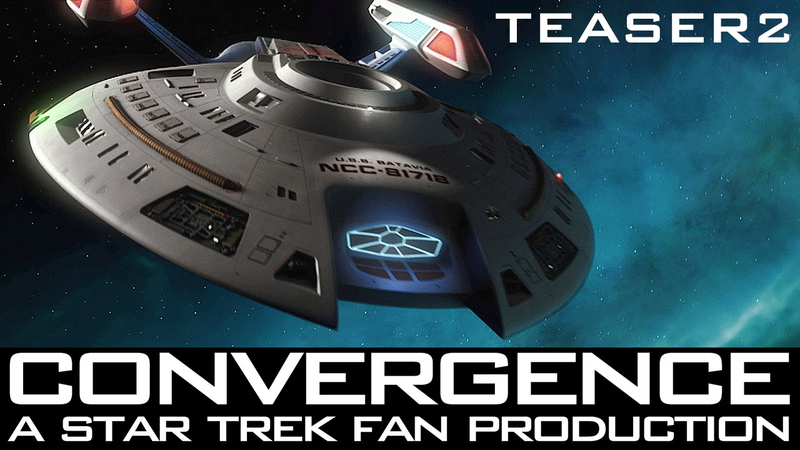 Final CONVERGENCE puzzle piece revealed in new TEMPORAL ANOMALY teaser! 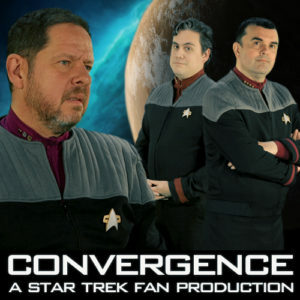 One of the intriguing “mysteries” about Convergence was the question of which fan films/series will be crossing over—there will be five in all. The first teaser revealed that Star Trek: Intrepid show-runner and star NICK COOK would be reprising his fan favorite role of Captain Daniel Hunter of the USS Intrepid. 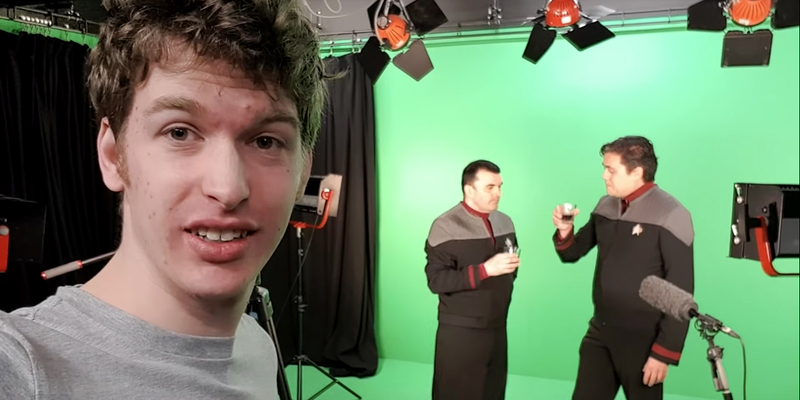 The second teaser revealed that the fan series Star Trek: Dark Armada would also be part of this crossover, with that series’ show-runner and star, ROBIN HIERT, playing his character Captain Alexander Richardson of the USS Batavia. The third and final teaser filled in another two pieces of the puzzle. JIM VON DOLTERAN of the Trek fan series Starship Republic will also be appearing, captaining a starship of the futuristic Archer-class, which was seen in the original Star Trek: Renegades fan film (before it de-Trekified itself). Also appearing in Convergence will be the alien Syphon race, the terrifying bad guys from Renegades. So with four fan films/series accounted for, fans still didn’t know the fifth…until yesterday when Samuel Cockings posted an unexpected FOURTH teaser! But this time, the teaser didn’t include footage from Convergence but rather from his upcoming (and long-anticipated) fan film TEMPORAL ANOMALY. (You can listen to an audio interview with Samuel about this project here.) This project’s release was delayed by CBS, but Samuel was ultimately granted a small guideline exemption in exchange for making certain adjustments, which are still being completed. 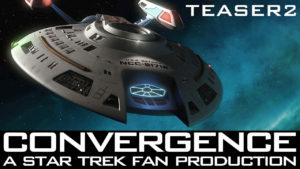 Author Jonathan LanePosted on September 17, 2018 Categories Fan Film Features, NewsTags Batavia, Convergence, Dark Armada, Intrepid, Jim Von Dolteren, Nick Cook, Robin Hiert, Samuel Cockings, Star Trek: Renegades, Starship Republic, Temporal Anomaly2 Comments on Final CONVERGENCE puzzle piece revealed in new TEMPORAL ANOMALY teaser! THIRD and final CONVERGENCE teaser fills in two more pieces of the puzzle! 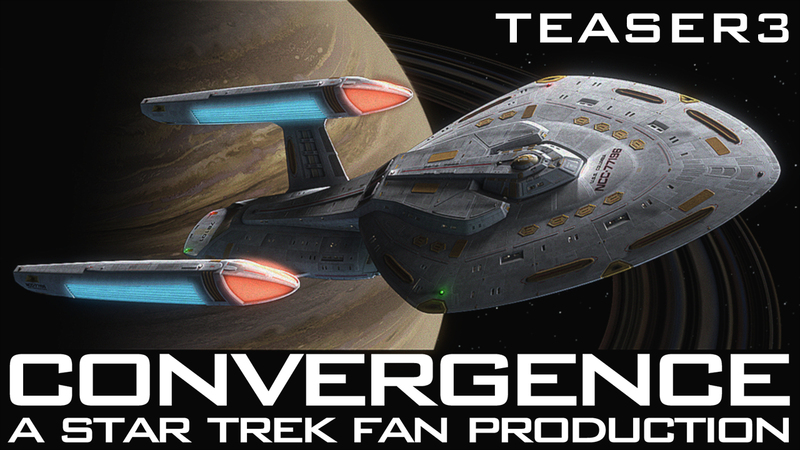 For the last couple of weeks, show-runner and “Trekyards” super-duper CGI trooper SAMUEL COCKINGS has been releasing a new teaser for his new fan project, CONVERGENCE, each weekend. Convergence will be a mega-crossover event, bringing together (according to Samuel) FIVE different fan films and series. STAR TREK: RENEGADES and STARSHIP REPUBLIC. That’s right! While the Renegades team have moved to a non-Trek universe, we are officially carrying on the torch for their Star Trek pilot and telling a new story with parts from the Star Trek: Renegades ‘verse. Also joining as our final captain is JIM VON DOLTEREN from Starship Republic! He will be flying to the UK to ensure that all our captains can be in the same room at the same time for some important scenes and to get the best quality production possible! 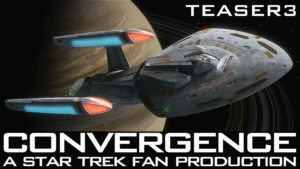 Author Jonathan LanePosted on September 12, 2018 Categories Fan Film Features, NewsTags Batavia, Convergence, Dark Armada, Intrepid, Jim Von Dolteren, Nick Cook, Robin Hiert, Samuel Cockings, Star Trek: Renegades, Starship Republic2 Comments on THIRD and final CONVERGENCE teaser fills in two more pieces of the puzzle! CONVERGENCE teaser number two features ROBIN HIERT of Dark Armada! The last time fans saw ROBIN HIERT playing the role of Captain Alexander Richardson of the USS Batavia, it was December of 2016 in the finale of the popular Dutch fan series Star Trek: Dark Armada. In the last minutes of that finale (spoiler warning! ), fans discovered that the entire series thus far had been taking place in the Kelvin timeline (24th century), and we finally got a glimpse of Captain Richardson from the prime timeline. At the time, Robin Hiert told me that a new sequel series, Batavia, would start filming the following year (2017). But it’s now far into 2018, and no episodes of that series have emerged yet. Samuel will be releasing a third and final trailer this coming weekend before launching an Indiegogo campaign to fund production and post-production on this FIVE-WAY crossover. Which other fan films/series will be included in the crossover besides Intrepid and Dark Armada? You won’t have to wait too long to find out! Speaking of which, I’ve been shown a rough cut of the “ask” video for the Indiegogo page…and it looks really amazing. To others looking to create crowd-funders, all I can say is watch this video and take careful notes! 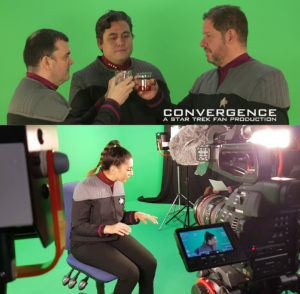 Because several Convergence scenes and VFX sequences have already been shot and rendered, Samuel is able to provide some clips from the film itself, plus excerpts from behind-the-scenes interviews along with lots of footage taken during shooting on the green screen set with the main four actors. So yes, you’ll definitely learn which other three fan films/series will be a part of this major cross-over event once the Indiegogo launches in a few more weeks. Author Jonathan LanePosted on September 5, 2018 Categories Fan Film Features, NewsTags Batavia, Convergence, Dark Armada, Intrepid, Nick Cook, Robin Hiert, Samuel Cockings1 Comment on CONVERGENCE teaser number two features ROBIN HIERT of Dark Armada! CONVERGENCE teaser released – first of three! 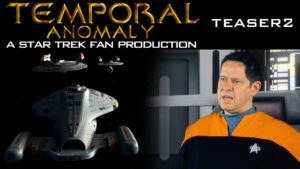 Samuel got the attention of the fan film world back in April when he also got the attention of CBS, who contacted him after watching the latest trailer for Samuel’s first fan film effort, TEMPORAL ANOMALY. CBS was not happy about the use of existing TNG movie footage and certain copyrighted music, and the length of the final production was likely going to be well beyond the two 15-minute parts limited by the fan film guidelines. After some discussions with CBS, and agreeing to remove the movie clips and replace the music, Samuel was reportedly given the green-light by CBS to exceed the time limit for this specific fan project. Samuel has since been reworking Temporal Anomaly hoping to release it very soon. 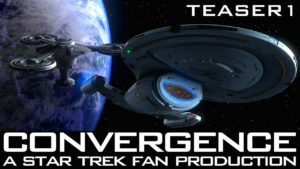 Samuel’s latest fan project, CONVERGENCE, will be launching a new Indiegogo campaign (yes, folks, another one of those!) within the next few weeks to fund production and post-production for this exciting film. Leading up to the crowd-funder launch, Samuel is releasing three short teasers—one per week—each featuring a voice-over “captain’s log” from one of the cast. The first, just posted this past weekend, has NICK COOK of the fan series INTREPID playing Captain Daniel Hunter. As you’ll see, the visual FX are amazingly good, as Samuel is an expert CGI modeler and renderer. Subsequent teasers will feature other lead actors from different fan series. Who will appear next week and the week after? Stay tuned! 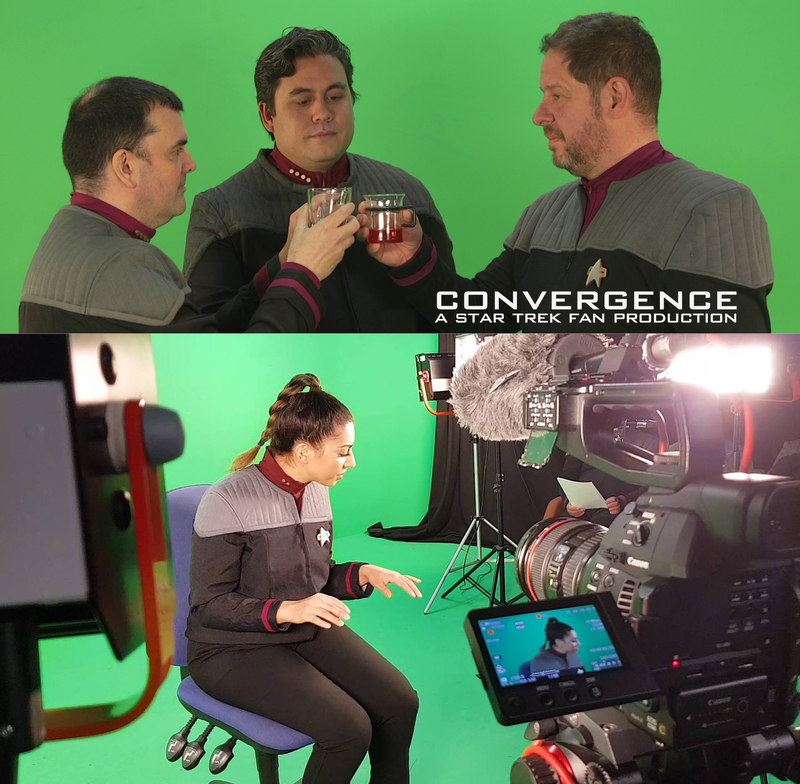 Author Jonathan LanePosted on August 27, 2018 August 27, 2018 Categories Fan Film Features, NewsTags Convergence, Intrepid, Nick Cook, Samuel Cockings, Temporal Anomaly2 Comments on CONVERGENCE teaser released – first of three! Fan Films, Assemble! Announcing: CONVERGENCE! So, have you seen Avengers: Infinity War yet? Pretty cool how a whole bunch of Marvel characters who each have movie series of their own—Iron Man, Captain America, Thor, Spider-Man, Hulk, Doctor Strange, the Guardians of the Galaxy—all come together in a single movie to fight the bad guys. If only something like that could happen with Trek fan films. 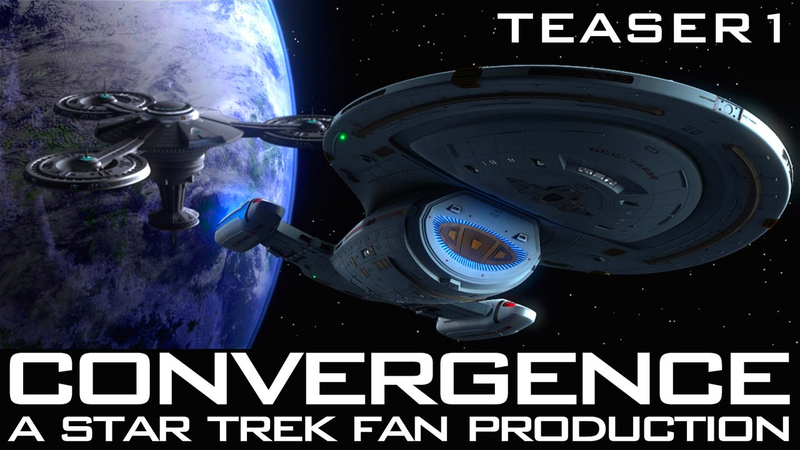 SAMUEL COCKINGS, whose fan film TEMPORAL ANOMALY will debut later this year after he makes certain changes requested by CBS, has just announced his latest Trek fan project: CONVERGENCE. This new production has been a closely-kept secret for several months now, and those folks who did know about it were sworn to secrecy. And certain nosey bloggers who did know about the project were told only that it was code-named “Star Trek Avengers.” In fact, even the title Convergence was only revealed to the actors a week and a half ago when they all, um, converged on the U.K. to film some initial scenes in front of Samuel’s green-screen backdrop. Eventually, the plan is to add on actors from an additional two fan films/series for a total of FIVE. That will be a record, as there have been a number of two-series crossovers (for example Hidden Frontier and Intrepid) and multi-fan film cameo appearances (three actors from New Voyages appeared in the pilot episode of Starship Farragut, and Vance Major featured several quick cameos of fan film notables in his later episodes of the Minard Saga). But this isn’t just the Falcon briefly appearing in Ant-Man or Hulk joining Thor for Ragnarok…this is full-on Avengers, man! Samuel launched a new Facebook page for the project, complete with photos introducing the cast. He’ll be adding one new photo per day for the rest of this week. In another month or so, Samuel plans to launch a crowd-funding campaign to raise money to complete filming (including transportation to the U.K. for all of the cast) as well as post-production. And yes, he fully intends to follow all of the the fan film guidelines. Author Jonathan LanePosted on May 1, 2018 Categories Fan Film Features, NewsTags Convergence, Dark Armada, Intrepid, Nick Cook, Robin Hiert, Samuel Cockings, Temporal Anomaly4 Comments on Fan Films, Assemble! Announcing: CONVERGENCE!